Babywearing is my passion -- I want every caregiver to know what a helpful tool babywearing can be, and how it supports their babies' healthy growth. Educators and lending libraries make that possible, and since the primary goal of my business is "babies on bodies! 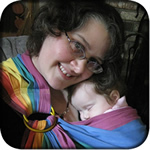 ", I do what I can to support babywearing educators and the other folks who help make babywearing more mainstream. With that in mind, I've long offered a discount to educators and librarians. In the past, I've done that with a coupon code, but that often gets forgotten, and also means that other codes can't be used at the same time. My cart allows customers to log in, and allows me to set different levels and give discounts accordingly. So now, if you have an account associated with your group/library/practice, send me an email and make sure it's on my list -- a bunch of groups are already in the system with a 33% discount applied automatically to their orders. If you're not, create an account, let me know what email address you used, and I'll set up the discount for you. This does mean the sizing sling is disproportionately priced before the discount is applied -- I settled on an actual price of $60, but I can't afford to have it discounted further (a lot of extra time goes into them). So it shows up, before the discount, as $90.91 -- that makes it $60 after the discount. Please don't let the list price scare you :) Also, each sizing sling comes with a free WCRS sewing service, and the discount does apply to that as well.